Neil Jones is an exciting new Welsh-born independent filmmaker, whose three feature films and short films have already traversed genres such as biography, Spaghetti Western, vampire horror and thriller. Alongside frequent collaborator Stuart Brennan, who with Neil is the co-owner of Burn Hand Films, he is a resourceful, imaginative and restless talent just waiting to be discovered by the masses. 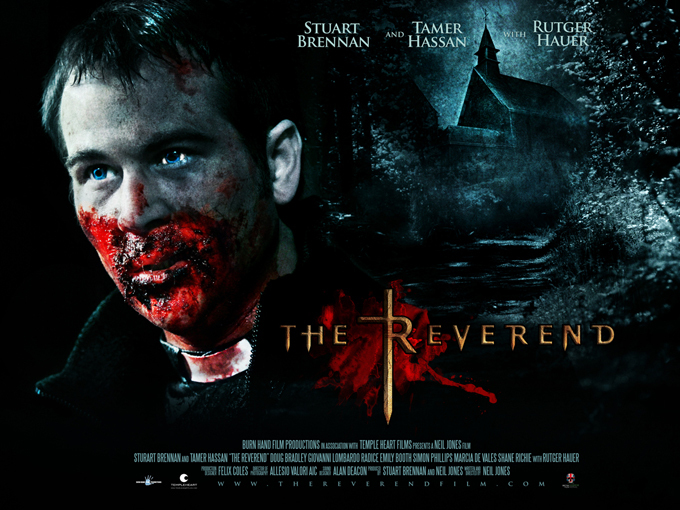 I spoke to him about his latest release, THE REVEREND (2011), a comic-horror with a difference, and with an opening cameo from cult legend Rutger Hauer. Can you talk about the graphic novel that inspired THE REVEREND? Who wrote it? I had just done a boxing film called RISEN (2010). It was my dream project about a real boxer from my hometown, Howard Winstone, and my first big movie. It was more arthouse than THE REVEREND. For my next film, I wanted to get as far from a true story as I could go. I had started writing THE REVEREND around 2007 or 2008, and hadn't intended making it at that time. I just got the idea and had to write it down. Actually, it was me that wrote the graphic novel, and I came up with it and the film at the same time. It will come out in early 2013. It will be pretty much the same as the film, but when it's on paper you are not limited in what you can do by a budget! How much of THE REVEREND was inspired by your own background in preaching? When I was 20, I moved to Chicago from the UK and went to Theology School, with the idea of possibly going into preaching. I'm not religious anymore but I have always been fascinated by the stories in The Bible, especially The Book of Job. I always thought it would make a great film. Unfortunately, I didn't have the massive Hollywood budget to make a historical film, so I decided to place the story in a modern context. Were you influenced by any particular horror films? I was going with a more Spaghetti Western vibe to be honest, not so much a horror one. Spaghetti Westerns are my favourite genre, and Sergio Leone my favourite director. I love the simple concepts of the films and they work so well. When I was writing THE REVEREND, I fell in love with the concept of having the man with no name coming into a small town and cleaning up the bad guys be a reverend, a man of the cloth. Clint Eastwood's PALE RIDER (1985) was a film that really influenced me. I also wanted to make a horror film with vampires, so I thought it would be a neat little twist to mix the two genres of Spaghetti Western and vampire horror film. That explains the soundtrack. It has a Spaghetti Western vibe. Chris King, the guy who did the music, is my close friend from my hometown. I've always told him that he should have come from the Deep South in America! I think the music - Deep South, bluesy, acoustic music in a very British film set in Wales - has thrown some people off but it was the sound and vibe I was going after. In what ways did you want to make a different vampire film? I didn't want to make a traditional vampire film where they are allergic to sunlight and garlic, and where they had teeth that came from nowhere when they are about to bite someone. I never could get my head around the teeth thing. Where do they come from and where do they go? What I did know was that drinking blood is something that animals do. We went for human flesh getting torn and not just puncture wounds. Vampires are obviously supernatural, but I thought let's just try to make it as realistic and brutal as we can. Stuart and I also researched how addictions like alcoholism affect people. The word 'vampire' is not even mentioned in the film, except in the cafe scene at the beginning. Was it your intention to have a lot of different regional accents in the town? Were you trying to create the idea of the town as populated fom people from all over the UK? It wasn't intentional, it just worked out that way. But I didn't bother me because I wanted to create an air of mystery about the town. It doesn't even have a name. Had you worked with a lot of the cast before? Yeah, I had worked with a lot of the lesser-known actors before, but not the better known ones. I wrote Emily Booth's part especially for her (the prostitute), because I wanted to see her do something that wasn't just just horror comedy. She's great in the movie. Was it a conscious decision to make some of the characters down and dirty? It's not a nice world we're creating in the film. The idea of a reverend coming into a town and beating up the bad guys is ridiculous, especially with Stuart, who is baby-faced and well-mannered. I knew I had to make it gritty and grimy at times or it just wasn't going to work for people. I thought if we are going to be light-hearted in a scene, then let's be light-hearted. And if we're going to be dark, then let's be really dark. In the balancing of the tones, were you inspired by any specific films or filmmakers? I don't think there was a specific influence, but like a lot of British people, as a kid I watched a lot of gritty TV dramas. They were in the back of my head. British filmmakers get a lot of stick for being bleak all the time, but I happen to like those kinds of films. That said, our film is also very commercial. How did you manage to get Rutger Hauer? The story is quite cool. Stuart Brennan and I came up with a list of actors we wanted, and we were lucky as we got about 90% of them. Rutger was never on the list because it was short notice and we honestly thought we would never get him because of our budget level. Our executive producer, Lyndon Baldock at Templeheart, said "Just find out if he's available. You never know!" So we phoned his agent and much to our surprise he was kind of interested. We set up a Skype call with him, he looked at some of our films and then to our amazement he said yes! Many have asked me why he is only in the film for five minutes but the answer is that we only had him for a day. Obviously, we would have liked to have had him for more. How was he to work with? He is cool, a total pro. He knew it was a low-budget film and he got stuck in, it was never an issue for him. It was a really nice experience. Did you get to talk to him about some of his films? He came into Cardiff a day early to go through some script stuff with us. You never know with these iconic actors. Is it going to be okay to talk to them about their biggest films? But my attitude was "If I am sitting in a bar with Rutger Hauer, there is no way I am going to let him go without asking about BLADE RUNNER (1982)!" He was cool about it and actually enjoyed talking about the film. Why did you think he would be great in the role of the 'Withstander'? Rutger as The Devil is just as cool idea! I've been a fan of his for so long. It's kind of surreal that he's in our movie. How did you come to cast 'East Enders' star Shane Richie as the evil pimp? It's kind of a left-field choice. Shane had played a London promoter in RISEN about two years before. It was a role he could do standing on his head. He had a good time and we became friends. He told me that if I ever had a role for him that was totally different from what he was used to, I should let him know. I think he's tired of playing the 'cheeky chappies' and because of his success on 'East Enders', it's all he gets offered, which is a shame, because he's a great actor. I knew he could pull it off, but if I'm honest, I wasn't sure the audience would accept him in such a different part. He is brilliant in the film, and steals the show. We just let him go for it. He was like a whirlwind, so prepared and full of ideas. It made my job easy. I remember the crew were looking at the monitors with an expression that said "This is weird!" Nobody had ever seen him do anything like this before. It was a really brave thing for him to do. We only had him for one night. Shane's a workaholic. He was doing 'East Enders' in the day and worked with us in the night. On top of that, his wife was due to have a baby the next day! Did you purposely keep his character in the shadows? It took me a while to recognise him. Because his character is so gritty and dark we wanted to keep the light very low and we kept pulling the focus in to give his scenes that surreal look. It ties in with his drugged-up state. Wasn't another actor lined up for the part originally? Actually, Tom Savini was interested in the part. He read the script 2 1/2 or 3 years ago and liked it and wanted to do it. Unfortunately, it just didn't work out logistically. How did you come to work with Mads Koudol, who plays Viking? Mads has done loads of films. Years ago I produced a gritty drama that unfortunately got put on the shelf. He acted in it because he knew the director.Mads is quite well-known because he did a different movie that was also directed by a Welshman, MERANTAU (2011). The director's name is Gareth Evans, and I've known him for years. He's from the next town to me. Gareth is famous now because he directed THE RAID: REDEMPTION (2011). I wanted Viking to be ridiculously over the top and Mads was absolutely fearless. The character is a hyped-up lunatic, like something out of MAD MAX 2 (1981). His scene really works. In hindsight, I would have liked to have done more with the character. The end fight in the barn with Viking was nerve-racking and exciting. It was my first time filming a fire stunt scene and we had a stunt guy called Jude Poyer who was set on fire from head to toe for 30 seconds. He acted like he was making a cup of tea! Where did you shoot the movie? How long was the shoot? We shot it in South Wales, where I am originally from. I now live in London. We shot for five weeks, and then came back for five days to do the scenes with Rutger and Giovanni Lombardo Radice, and a couple of pick-ups. How was the film financed? It was financed completely by a company called Templeheart Films who had financed some of RISEN. 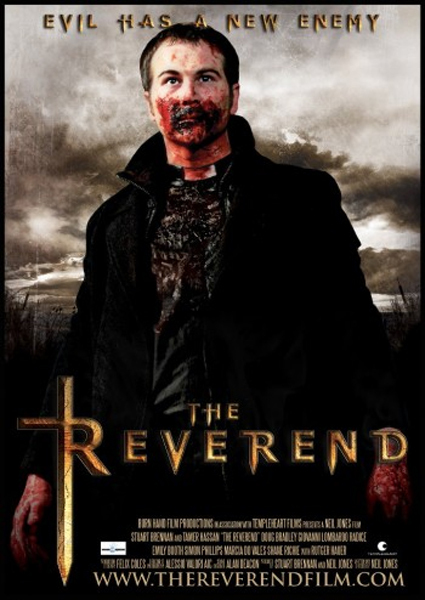 I just pitched THE REVEREND to them and after they had the read the script, they decided to come in for full, which is really nice because usually on independent films the finance comes from different sources. How did your working relationship with Stuart Brennan start? We met about ten years ago at University. I had no aspirations to be a filmmaker originally, but Stuart was an actor who had gone out with a video camera and made a film for no money. I saw it and was quite impressed with it. I liked the energy that he had and I wanted to get involved. It's just kind of snowballed and ten years later here we are still making films. Why do you think you work so well together? We're very different personalities. I guess we complement each other. After the hard time we had trying to get my dream project RISEN made, we really trust each other. After we finished the movie we thought "If we can make that, we can make anything!" What were the most challenging aspects of making THE REVEREND? Like all low-budget movies, it's tough because you never really have enough money to do what you want to do, so you're always making small compromises along the way. It isn't the best feeling for a director. Trying to get everything shot in five weeks was tough, even though that is actually a long time for a low-budget movie. It helped that I had everything planned out in my head. What were the most fun aspects of the shoot? Apart from Rutger, Shane and all the actors, I also enjoyed working with Tamar Hassan. We had him for five or six days, and again, he has so much energy and so many ideas. I always have strong ideas but it's fun to be able to bounce ideas off the actors. It becomes infectious and the crew feeds off it. How do you feel about the critical reaction to the movie? On RISEN I was devastated by any bad review, but you have to grow a thick skin in this business. I don't take it personally now. Some critics didn't like the mixing of genres in the film and the different tones. They said the film lacks focus and solid direction. I had a great cast and some great ideas, and I wanted to put them all together. The film mightn't have come out perfect but I think we did what we set out to do. There's been no middle ground with this movie. People seem to either love or hate it. I kind of like having a split opinion! Can you talk about some of your future projects? Last summer I directed a slasher movie in Spain called DERANGED with Craig Fairbrass from CLIFFHANGER (1993). We've just finished post-production. I'm developing a thriller with Tamar Hassan. There's a possibility of doing a film in Australia. I have done two horror films in a row and would like to do something different. The goal is to keep making films that inspire me intellectually as well as visually, and to keep making them bigger and better. Can you see yourself moving to L.A. to further your career? As long as I can find finance for the films I want to make, I don't feel the need to move to L.A. If you've got a camera, you can go anywhere in the world. I'd like to make a film in Asia, for example. But my dream is to make a really cool Western. Which filmmakers from the past and present do you enjoy? As I mentioned Leone is my favourite. I guess nobody will ever make films like he did nowadays, but it would be great if they did. I grew up watching Hitchcock. His films are so complex but he makes it look so effortless. How could you not be inspired by that? I also love Scorsese and Christopher Nolan. I loved his 'Dark Knight Trilogy'. I spoke to Neil by telephone on 20th August 2012. I would like to thank him for his time. Thanks to Richard S. Barnett. Paul Rowlands is a Japan-based writer. After completing a BA Humanities course (majoring in English and Science) at the University of Chester, he moved to Japan in 1999. He writes for the James Bond magazine, Kiss Kiss Bang Bang, has had articles published on Press Play and other sites, has written unpublished novels and unfilmed screenplays, and has had an almost lifelong obsession with cinema, something the advent of DVD only increased.